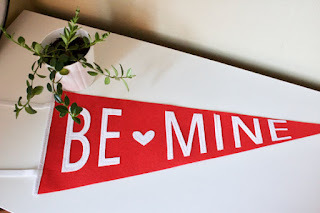 I was returning a few things as Target today, and I couldn't believe their Valentine's decorations were already up! Really? Then I thought, we are only a month away. 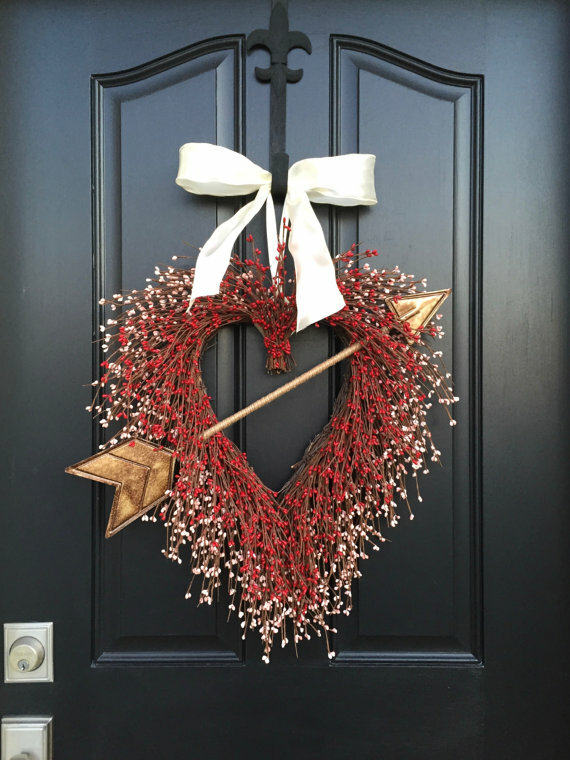 It may be too soon to run to Target, but if you want some Etsy decorations, now is the time. So here are some of my favorites up on Etsy now. My goal now is to stop binging on ugly Target and Michael's decorations (one of my favorite stress-relievers) and only buy one or two pieces in a year. So yes, these are more expensive than the made in China plastic sparkly nonsense at Target, but they will last a lot longer and you don't have to wonder if someone is working in poverty for you to have it. 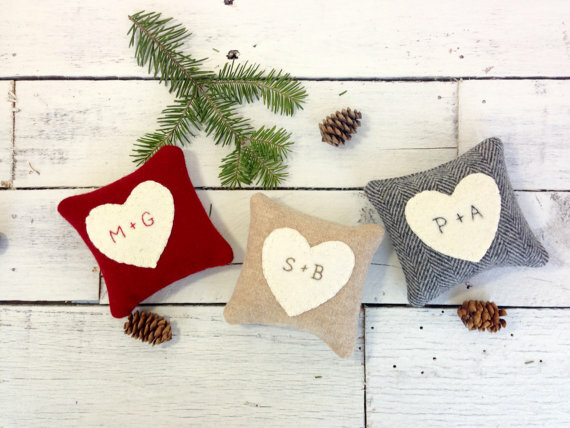 Away Up North (Bethel, Maine) makes super cute personalized heart pillows. They are only 4x4 or 6x6, but they would look so cute on a bed (or as a ring pillow if you are working towards a wedding). I love the throw pillow idea as a decoration, because it still has a purpose, and if it is a pillow case, you can store it easily as well. Like the pillow idea but looking for another style? Try Toy Hollow NJ, Nostalgic Revivals, or More Chenille Chateau. twoinspireyou (Illinois) makes all sorts of wreaths and things to hang on the door (lots of hearts), but I love this wreath the most. Pretty, a little cheeky, and it screams Valentine's Day. 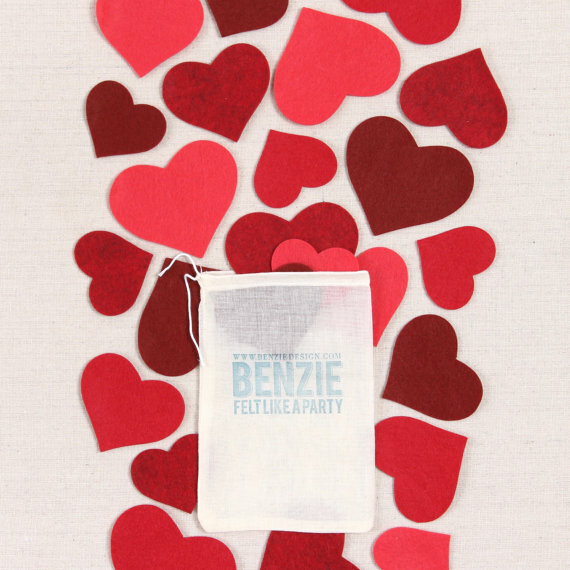 Benzie Design (Illinois) sells lots of felt shapes. I love the cut of their hearts and they would make a really adorable banner. Nice if you are looking for something more playful than romantic. For more banners, check IchabodsImagination, MrsMorrisMade, Mailbox Happiness, and caitlinwilheim. 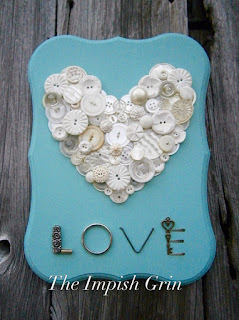 The Impish Grin (New York) makes these pretty hearts out of recycled buttons and keys. The fastest way to my heart is recycling things AND making something beautiful. These would look perfect on a mantel. b childrenswear (Seattle) has romantic pendants and even a broken heart pendant! I love the humor of these, and I just think it would be a super playful and fun decoration (or gift).